That's What Bob's Cooking: Copper River Salmon! The Copper River is a 300-mile river in south-central Alaska in the United States. It drains a large region of the Wrangell Mountains and Chugach Mountains into the Gulf of Alaska. . It is the tenth largest river in the United States, as ranked by average discharge volume at its mouth (a total of 24,000 square miles, an area the size of West Virginia). This river is known for its extensive delta ecosystem, as well as for its prolific runs of wild salmon, which are among the most highly prized stocks in the world. Those famous salmon runs arise from the use of the river watershed by over 2 million salmon each year for spawning. The extensive runs result in many unique varieties. 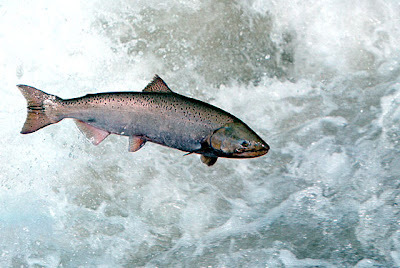 The river's commercial salmon season is short: Chinook (king) salmon are available mid-May to mid-June, sockeye (red) salmon mid-May to mid-August, and Coho (silver) salmon mid-August to late-September. Copper River Salmon are silvery salmon with a bright red flesh, a firm texture, and a rich flavor, that originate in these pristine waters and are challenged by its length and its strong, frigid, glacier-fed rapids. Consequently, Copper River salmon are strong, robust creatures with a healthy store of natural oils and body fat. These qualities make the salmon among the richest, tastiest fish in the world. Fortunately, fatty Copper River salmon is good for you, as it is loaded with Omega-3 oils. Copper River salmon is a big deal in Seattle and around the Pacific Northwest. That being said, last night’s dinner was so good, I only wish you could have had tasted this amazing fish. A few months ago, I purchased a mesh "pan", clearance. It was about $.15, so I bought the entire case they had marked down. People, Check those clearance racks at the end of the season, and pick up all that you can store for the next season. Then lastly I took the Salmon and cut it into portions, placed the shaved onion on the mesh pan, put the portioned salmon on the onion, and VERY lightly salted the salmon, sprinkled it with some dried, and crushed rosemary, and grated lemon peel. (see below) I them grilled it until the salmon just started to flake. If you cook it until it starts to flake, you will have a perfect piece of fish. With the Salmon, I served Wild Rice with Toasted Pumpkin Seed and Chives. I included a couple of pictures of the pumpkin seed, both raw (right) and toast (left). Make the rice according to my previous direction. For wild rice you will need to boil the rice a little longer, because it a tougher rice. When the rice in completely cooked, toss in the chopped chives and seeds, and a little butter.